I paint, I write, I make stuff. But several years ago we had a heck of a year with a windstorm that knocked out power to hundreds of thousands in the area for as long as four weeks. (We were without power for a week and completely unprepared.) The February after we had an ice storm that slammed us with 3 inches of ice. It was genuinely spooky walking around the house that night checking for damage before letting the dogs out, hearing nothing but echoing silence and the occasional crack and smash of ice sliding off a roof or breaking a branch. Later that year in August we got six inches of rain in about 30 minutes leading to a ton of flooding. I started trying to “prep” after the first incident (primarily trying to keep a little extra food, toilet paper and such on hand and also making sure we owned a grill so we could cook food if it happened again.) but after the third I started trying to do more. It’s not easy to do, especially on a limited income. But I have kids and pets and I know much better now than to take phones, power and nice supportive neighbors for granted. Last night Louisville got a bit of a snow storm. I grew up at least partially in South Bend and am smart to lake-effect style snow storms. A lot of people around here are. A lot aren’t. And some just get stuck in the wrong place at the wrong time. 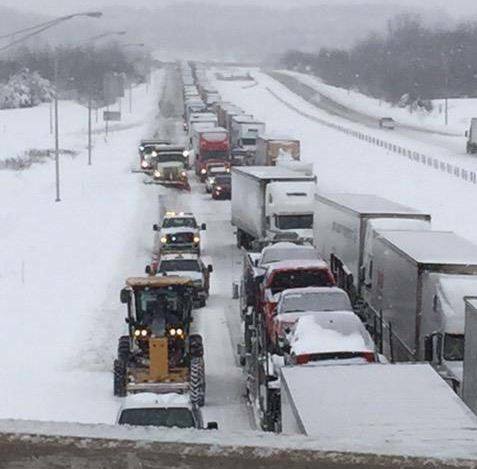 This is one of the highways, I 65 during this storm. Louisville saw almost 12 inches of snow fall overnight. Other places saw over twenty inches. Most of those places are outlying towns and neighborhoods, places with either few winter supplies because it doesn’t make much fiscal sense to buy and keep up a fleet, or places “between” the cities who do snow removal. It’s real easy to fall through the cracks. A friend of mine was caught in this, coming north from Bowling Green. Her stories at the complete lack of aide drivers were offering, to the point of blocking each other in out pure selfish attempt to get a few inches closer to home, are…disappointing. But not surprising, because having been out in it for the first few hours the number of people taking insane, stupid risks, especially on slick roads, had me screaming at drivers all around me. People are stupid, and that’s a vast understatement. My friend was able to help others with water and food and warmth. But she talked about people running out of gas, people travelling with no food or water and no way to get any, fifty miles from anywhere. Feel free to add you recommendations in the comments. Also you can read more about the rescues here and here. Share book reviews and ratings with Michele, and even join a book club on Goodreads.